A cluster of 8 states that form the eastern most region of India is a magnificent oasis for travel lovers. with cascading waterfalls, iconic national parks and age old heritage locations this part of India is also popular for its spirituality and should be visited during your holiday in north east India. there are numerous Buddhist monasteries and temples that adorn this region and people from far and wide visit to spend some peaceful time in its tranquility. The culture of North east is not only vibrant and colorful but it is also extremely well preserved and distinct from the rest of India. It is known for being the hub in Buddhist spirituality which still remains unexplored and comparatively untouched from the outside world. the serenity that you will experience amidst this picturesque landscape is unparalleled and unique to anywhere else. 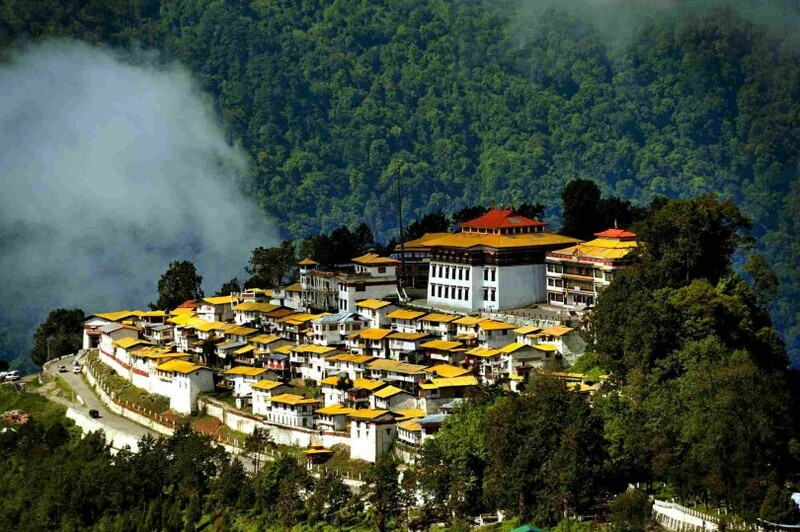 Also popularly known as Dharmachakra centre this glorious monastery is located close to the capital of Sikkim, Gangtok. The monastery was originally constructed during the 1700s by the 12th Karmapa Lama and ever since then it has served as the main seat of the Karma Kagyu lineage. Perched on a hilltop this is one of the largest as well as the most significant monasteries in India. this is one of the most glorious monasteries which is set amidst the lush greenery against a magnificent backdrop of mighty mountains and offers incredible solace to the visitors. Located amongst the hills between Rathong chu and the glimmering Rangeet river Tashiding monastery, belonging to the Nyingma section of Tibetan Buddhism, is situated in the western end of Sikkim. The old world charm along with the quiet serenity makes this gompa extremely calming and soothing to every visitor. Sitting gloriously against the backdrop of the snow clad mountain ranges, this unique looking monastery is one of the oldest monasteries in Sikkim. It is believed that a visit to this monastery will cleanse you of all your repent and you will be offered forgiveness. Located just above the besutiful destination of Gangtok, this monastery was established in the year 1909 and it belongs to the Nyingma sect of Vajrayana Buddhism. Ever since its establishment this holy site has always been a centre for religious activities. The vibrancy of this mosque lies in the fact that the entire walls and prayer halls are adorned in colorful paintings, murals and pictures as well as scriptures and other important holy designs. This small yet highly significant monastery is set among the tall, lush green conifers which gives the entire region a feeling of deep spirituality. Popular for its 15 feet tall statue of Maitreya Buddha, this monastery is also known as Yiga Choeling which was established in the year 1850. Located at a distance of almost 7 kms from the vibrant hill town of Darjeeling this monastery is also famed for being one of the oldest Tibetan Buddhist monasteries in this region. The entire monastery is adorned with a number of quirky features like thanka scrolls, bells and drums. Visitors can also take a look at a range of ancient Buddhist manuscripts and spend some serene time with their family and loved ones. Situated amidst the scenic greenery of Tawang valley in Arunachal Pradesh, this holy destination is famed for being the largest monastery in India and the second largest in the world. Located in close vicinity to the Tibetan and Bhutanese border Tawang has been mentioned as the celestial paradise. This monastery is placed among a complex of 65 resident buildings and the library here contains extremely vital and ancient scriptures along with valuable manuscripts of Buddhist relevance. Situated at a comfortable distance of 6kms from Ravangla this monastery belongs to the followers of Kagyu sect which is a past of the Tibetan Buddhism in Southern Sikkim. The architecture of this monastery works as its appealing factor and attracts visitors and devotees on a daily basis. The golden top and the colorful decorations clearly showcase the opulence and richness of the Budhist art. Visiting this holy site during the month of August will greet you with the annual festival of Pang Lhabsol. Also popularly named as Ranka monastery this magnificent looking holy centre is situated at a distance of 20 kms from the wonderful hill town of Gangtok. Considered to be as one of the most beautiful monasteries in the eastern end of Sikkim, there is not much of a historical or religious significance associated to this place since it has been constructed recently. This monastery is surrounded in all sides by thick and lush green forest which gives this place a vibe of incredible spirituality. 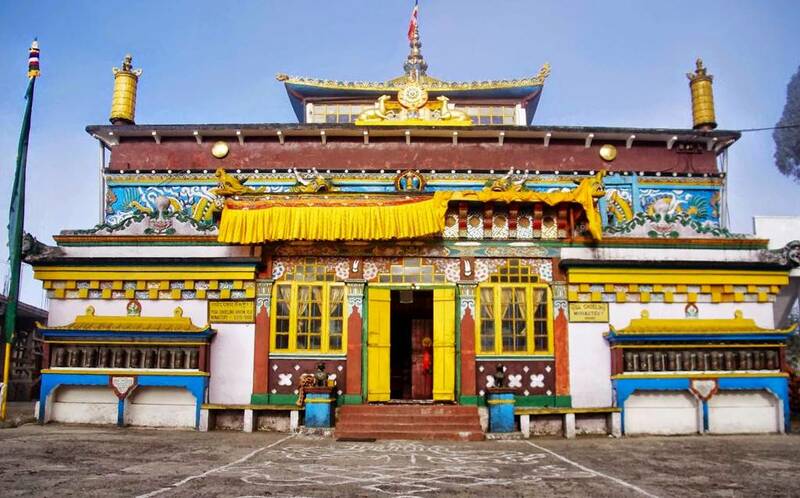 Located comfortably in the western district of Sikkim this monastery was constructed in the year 1716 and at a distance fo 10 kms from Tashiding. Literally meaning ‘the suppressor of intense fear’, this iconic yet humble monastery which depicts a typical Buddhist architecture, has always been of spiritual importance. Built under the leadership of Pedi Wangmo this place is decorated with brilliant hues of red and other vibrant colors which depict the cave paintings from Ajanta caves of Maharashtra. Famed for being one of the best and the largest monasteries in Sikkim and located atop a hill, this monastery is also popular for being home to the largest number of monks here. The setting up of this monastery dates back to 1721 AD when on his way to Northern zone the 3rd Lhatsun Jigmed Pawo had established this holy site. Set against the rolling lush green mountain tops this vibrant looking monastery evokes a feeling of immense spirituality to every visitor due to its serene location and tranquil environment. Situated close to the gorgeous hill town of Pelling in the magnificent state of Sikkim, this monastery is popular for being one of the oldest monasteries in the state. Originally built during the 17th century by Lhatsun Chenpo, this monastery religiously follows the Nyingma order. The architectural form of this monastery is that of a distinct Buddhist style with ornate and opulent decorations along with a golden rooftop. Located against the backdrop of the snow clad mountain ranges Pemayangtse is situated at an elevation of 2,085 metres above sea level making it extremely beautiful and picturesque to look at. Sitting amongst the mesmerizing and extremely awe inspiring views of its clean surroundings Lachen Monastery was built during the 1858 AD by the Tibetan Buddhism sect of Nyingma. Initially this monastery was just a small hut which later on was transformed into a magnificent Buddhist centre of pilgrimage. This holy site is adorned with vibrantly colored Tibetan prayer flags and finely carved prayer wheels. The most ideal time to visit this place is between the months of March and June when the entire place springs to life. 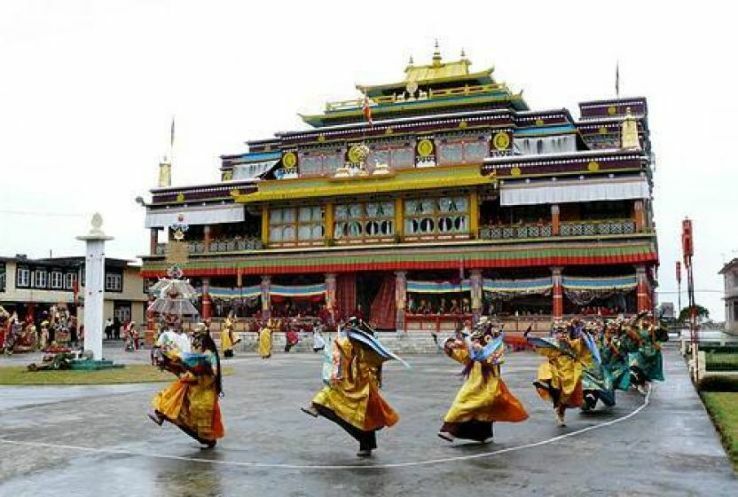 Established in the year 1730 by Ngadakpa Lama at an elevation of 1,700 metres above sea level, this colorful looking, vibrant monastery is one of the prime places of tourist interests in the western region of Sikkim. The monastery is famed for being home to a rare Adi Buddha statue sitting in a yab yum position (meditative state) while embracing a woman. On your visit to the monastery you will be greeted with a lining of colorful prayer flags that will evoke a feeling of unparalleled spirituality within you. Established during the 17th century by Lama Lhatsun Chempo this place is known for being one of the oldest monasteries in the entire state of Sikkim. Literally translating into the ‘island of the guhyamantra teachings’, this humble looking monastery is situated on atop a hill right above Pelling and at a distance of 7 kms from Pemayangtse monastery and can easily be accessed by trekking your way up the forest cover. This entire location is surrounded by scenic backdrops and panoramic views all around.